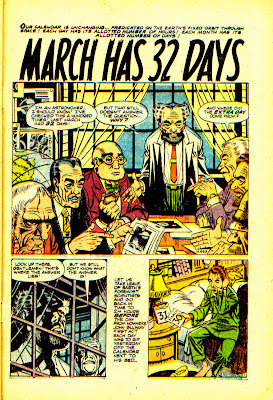 Chronological Snobbery: "March Has 32 Days"
As we approach the end of the month of March, we should pause to reflect upon the comic book story "March Has 32 Days" and its relation to ABC's "Lost." You can read this four page story here from Mystery Tales #40, published in April 1956, at a blog dedicated to this very issue of that comic series. It was featured prominently in "Cabin Fever," the eleventh episode of the fourth season of "Lost," some of which takes place in 1956. (You can learn more about this comic book's significance in the "Lost" universe here, and as per a commenter below, here). Enjoy. And remember how many days has March. Surely, you actually meant to direct people to learn more about the comic book's significance in the Lost universe here.